Weight: Empty 14,250 lbs. Maximum takeoff weight 24,150 lbs. Performance: Maximum speed over 430 MPH. Ceiling over 70,000 feet. Range 2,880 miles with 4,000 pounds of ordnance. This aircraft was designed and used for high-altitude communications intelligence and electronic intelligence and was capable of day or night all-weather surveillance. The U-2 has been configured with an array of cameras, electronic intelligence equipment and radar-homing and warning systems, depending upon it’s mission. The U-2 aircraft played an instrumental role in detecting Soviet intermediate-range ballistic missiles during the Cuban missile crisis of 1962. 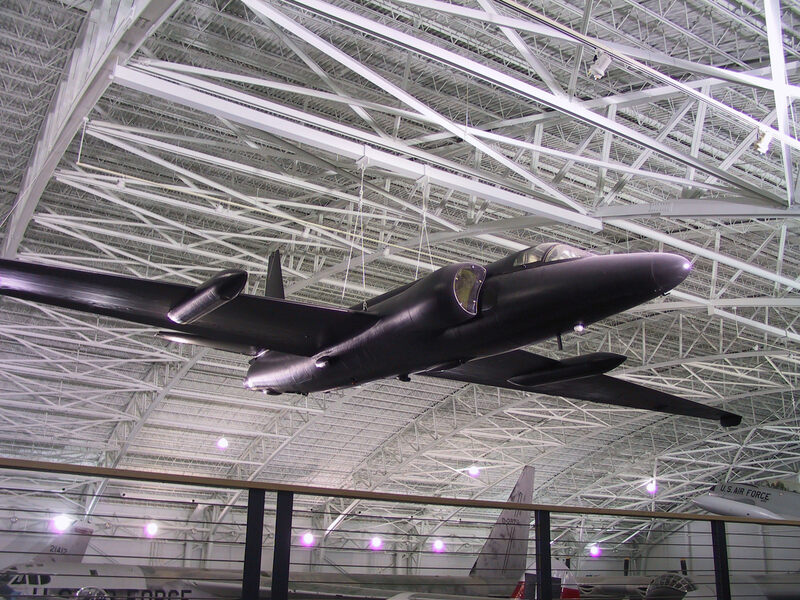 The U-2 “Dragon Lady” gained notoriety when one- flown by Francis Gary Powers, a former SAC F-84 pilot- was shot down during and intelligence gathering mission over the Soviet Union on May 1, 1960. The U-2 is still considered today to be one of the most technologically advanced aircraft ever built. It’s development in 1954 was shrouded in great secrecy since it’s primary role was strategic reconnaissance. Designed to fly for long periods at very high altitudes, it is essentially a powered glider with a sail-plane-like wing and lightweight structure. About our U-2C: Nicknamed “The Saint” during it’s service with the Air Force thunderstorm research program, this U-2C (S/N 56-6701 also served with the Central Intelligence Agency and various Reconnaissance Wings. The aircraft has been converted from a U-2A to a U-2B, and finally to a U-2C model in 1968. It was dropped from the inventory and flown to the Strategic Air & Space Museum in 1982.